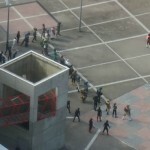 A few overhead shots of filming from the “Hesei VS Showa” Project have surfaced online! 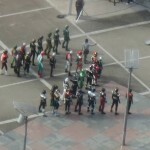 The main image confirms that ALL main Rider suits are in use for this film. To date only a few Riders are confirmed to appear out of suit but we hope there may be more old favorites showing up to surprise everyone. In addition, a number of classic Rider villains are also on-set, including the Crisis Empire from Kamen Rider Black & the Badan from Kamen Rider ZX. Be sure to join our discussion thread to share your thoughts & fears for this new project! “Hesei VS Showa” comes to theaters March 29, 2014! 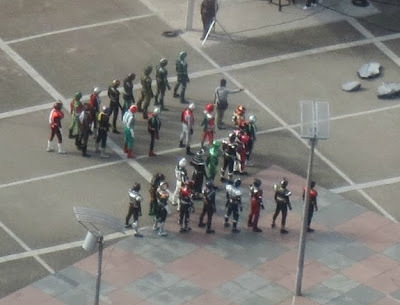 With the latest Movie War opening in Japan this weekend, Toei appears to have begun working on their next epic teamup. The newly-launched Superhero Movie site features a compilation of every major Kamen Rider from both eras and also refers to the project as "featuring Super Sentai." Whatever it is, there's a release date of March 29, 2014! Let the rumor mill turn! Think about how cool this could be fight-wise. We have moved past the not so kid friendly Amazon, Den-O. Given your name you should know that. Shin ain't havin' any of that.